Crafting Confessions: A Polkadot Party! Never one to make a decision, I had my cake and ate it - it's a party afterall - and incorporated all three sources. I'm hoping it's obvious I picked the crocheted flowers! I also tried to include part of the sentiment and some of the colours of the photograph. So come and join the party celebrations! Peeps who play along could be in with a chance of being invited to participate in next month's Bloghop as part of the Polkadot Door Designs DT! As well as the fun Bloghop and Inspiration Challenge, the blog itself received a birthday treat and has had a makeover. Take a trip over there: it's looking fabulous! Winners will be posted on the 16th! It's not a party without you Aimes and you brought the best card ;D I LOVE the gridded circle esp. Hope you are well and are enjoying your lie in! Oh love the background stamp...gorgeous card Aimes! Plum goodness! Have a great weekend! Super sweet clean and simple take on the inspiration, my kind of card! Okay, love your card... need me to shout it from the roofs so you get some more comments? you are always number one with me! I love that you have all 3 inspiration pieces in a CAS card..that is no easy FEAT!! You are a creative genius! And this card is going to make me smile all weekend thinking about your future visit to Canada to help me plan the studio...a business trip! hugs! Beautiful card Amy! So clean and fresh, it absolutely makes me smile. Thank you so much for being part of our blog hop. I just love how simple your card is- so pretty! The the circle grid. :) Nice work. What a beautiful card! simple and elegant! I love how you've taken lots of inspiration, mixed it all up and created one of your fab CAS designs. A very thoughtful take on the inspiration without creating clutter - great! So pretty! Like that it is clean and simple, but has beautiful elemnts on it. I love your clean and simple card! It sure made me smile!!! Love this CAS card!! The purple is so pretty and I love the flower! The most beautiful clean and simple card I've ever seen!" I adore your take on this inspiration challenge. That circle grid is making me swoon! Great CAS take!! such a super sweet card girlie! Love your card! Clean and simple- right up my alley! What a delightful and creative card! Love it! And I just found your blog and am now a follower. So very nice to meet you! Stop by my blog sometime and give me a shout out! Clean, simple, yet so pretty. The colors pop as does the flower. Great job! oh i love your take on this! the grid..the sentiment..the flower...gorgeous! A gorgeous card. I love the colours you have used and the flower is beautiful. Love this card. The flower is beautiful. simple, lovely and elegant, yet takes my breath away. Great work! Gorgeous CAS card! That grid stamp is awesome! Simple, elegant and fun - great card. I love your stamping work! OOOHHH!!! This is gorgeous!!!! 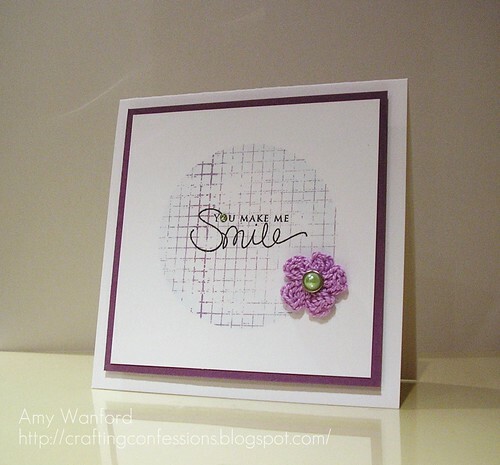 LOVE the purple crocheted flower - you've used it brilliantly and in ture Aimes style!!! The green brad is FABULOUS! Love this GF! Leave it to you to come up with a clean and simple and Beautiful card. Love it! I love the simplicity... really fabby job! I love that sweet little pearl in the middle of the flower! Such a fun blog hop! Thanks for the inspiration!